WRI’s Dr. James Morgante and his research team are pleased to announce a partnership with the Bridge of Books Foundation. The Bridge of Books Foundation is a non-profit, volunteer organization that provides books to underserved children throughout the state of New Jersey. Provided books are intended to nurture the development of literacy skills and foster a love of reading. 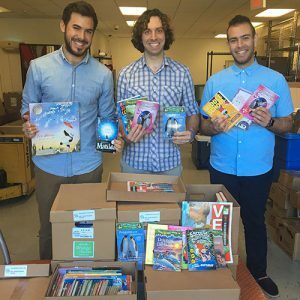 On Thursday, September 15th, 2016 the Bridge of Books Foundation donated over 400 children’s books to WRI. Fiction and non-fiction books, for children aged pre-K through 8th grade, will be given to South Jersey children of incarcerated parents who participate in a research initiative intended to understand the impact of incarceration on parent-child relationships. Funding for the initiative comes from the Pascale Sykes Foundation. In partnering with the Bridge of Books Foundation, WRI hopes to explore how joint-book reading between children and their incarcerated parents can strengthen family relationships and, potentially, reduce recidivism. The research initiative is expected to begin this fall. Page last updated by Senator Walter Rand Institute for Public Affairs at 3:10 pm November 3, 2016 . This page was printed from http://rand.camden.rutgers.edu/2016/10/31/books-partnership/ at 4:51 PM Monday, April 22, 2019.